Winged Heartless that mostly appear in Neverland. They are extremely combative and are hardly ever caught off guard. They attack with martial-arts-like techniques. A winged Heartless that mostly sticks to Neverland. It's not armed, but it doesn't need to be. The Air Pirate deals a brutal punch right after its fist flashes. Avoid its retaliating tackling kicks by using the reaction commands! Stop enemies from breaking item cards you use. The Air Pirate is an Emblem Heartless found in Kingdom Hearts, Kingdom Hearts Chain of Memories, and Kingdom Hearts II. The Air Pirate dresses very much in a pirate-like fashion, wearing a blue-and-white striped head scarf, a light blue neck wrap, skull-shaped shoulder pads, golden bracelets, bright blue baggy pants tied with a yellow sash, a brown knee-pad on its left leg, and long, narrow black shoes with brown straps. 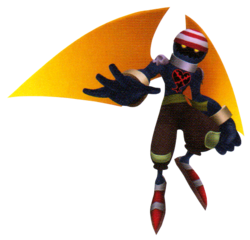 On close inspection, appears to be a cousin of the Soldier-type Heartless, featuring the same yellow eyes, shadowed face, and jagged blue jaw. It also boasts a trim blue-skinned torso, fit for battle, and bright purple wings, enabling them to swoop down on enemies for an attack. The Kingdom Hearts Final Mix version looks the same except for a palette swap, with the main color differences including a red-striped head scarf, brown pants, silver knee-pad and bracelets, red shoes, and bright gold wings. 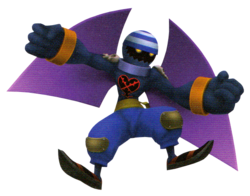 The Heartless's name references the fact that it can fly and glide through the air in battle, and that its design looks very much like a stereotypical pirate. Air Pirates are not a particularly difficult enemy if dealt with quickly. Since they have no resistances, all spells work well against them. Being an airborne enemy, the best strategies are to use Thunder or just attack it with the Keyblade. Air Pirates are generally easy to defeat. Sora can jump and use an aerial combo to destroy it, or use magic like Thunder, or airborne Blizzard. Back away when it starts to circle—this means it's about to attack. Another good way is to use the Reaction Command "Air Twister". To do this first hit the Air Pirate once, then get a lot of distance between Sora and the Air Pirate. Then after it does a pointing pose, it will charge Sora with a kick. That's the time to use "Air Twister", which allows Sora to spin the Air Pirate around and attack surrounding enemies. This page was last edited on 1 May 2018, at 18:46.